The Sig Sauer P220 one of my favorite pistols. A class double action pistol chambered in .45 ACP, it’s easy on the hands and fun to shoot. In its initial version, the P220 featured a traditional DA/SA trigger arrangement with a decocking lever, but no manual safety mechanism. There are multiple versions of the P220 platform available now, including double-action only and single-action models for cocked-and-locked carry. The P220 and the rest of the P220 series of pistols are legendary for their durable construction and reliability. They also perform quite well in the accuracy department, thanks to their outstanding triggers and smooth actions. It comes as no surprise then that the Sig pistols are favored by military forces, police organizations, and armed civilians around the world. Of all of the holsters reviewed in this article, the Uncle Mike’s Open Top Reflex holster is probably the best Sig P220 holster for the money. It can be worn as either a belt holster using the integrated pancake loop, or used as a paddle holster. To understand why the Open Top beat out other P220 holsters, let’s take a look at some important considerations when buying a new holster for your Sig. In order to choose the best holster for the Sig P220, it’s important to how you intend to use the gun. We have to ask: what it is we want our holster to do? Duty holsters by their nature are required to be somewhat durable, robust and offer outstanding weapon retention without any consideration of being concealable. Conversely most civilians who carry pistols are required to do so in discrete fashion, and need a holster that is designed for that purpose. The requirement for conceal-ability means that size of the gun and fit of the holster to the body are very important. In order to achieve a high level of concealment, some people choose to carry a compact or subcompact pistol. There are certainly many handguns on the market that are more concealable than the Sig P220, such as an affordable 1911 or a popular Glock. For those that choose to carry a full-sized pistol like the Sig P220, concealment is a function of holster selection. Each type of holster offers its own advantages and its own drawbacks to consider. Every holster represents compromise, so you make decisions about which features are most important and how much money you have to invest in a holster and go from there. The main factors to consider when choosing a holster are security, access, concealment, and a “half consideration” goes to one-handed re-holstering. Every concealment holster has a different mix of attributes that determine performance across these areas. One factor the above article does not mention is comfort. Comfort is important because if a holster is uncomfortable or cumbersome you will not wear it. If the holster is downright unpleasant to wear, most people will just leave their gun at home where it is useless. Inside the waistband holsters may offer the deepest concealment, but most do so by sacrificing some comfort. Many inside the waistband holsters are very minimalist, so not all have good retention or a lot of adjustability. IWB holsters are also typically more difficult in the one-handed reholstering department than OWB models. IWB carry and appendix carry in particular has become very popular recently, and custom molded Kydex holsters are very big right now, so IWB holster users are starting to see a much bigger selection of good products. Paddle holsters are usually considerably more comfortable, but generally lack security of the holster to the body. Also, paddle holsters are definitely not as concealable as IWB holsters. A high point of paddle holsters is the easy on/off factor. Belt mounted outside the waistband holsters are very popular, and there are many different holsters of this type available for a variety of handguns. Most tend to agree that belt-mounted holsters are more secure than those with paddles. The majority of concealed carriers will find outside the waistband (OWB) carry more comfortable than inside the waistband (IWB) carry. Having a layer of clothing between the skin and the gun or the skin and the holster makes a world of difference in comfort. There are several types of outside the waistband concealment holsters and various methods of attaching them to the belt. OWB holsters generally offer a mix of comfort and concealability. Because there is are many choices of styles and materials, there will be a lot of excellent choices available for the Sig P220 in this category. Pancake holsters are OWB holsters that attach to the belt via loops of material on the sides of the holster. The lack of belt clips or loops protruding from the front or rear of the holster gives pancake holsters a very flat profile. Traditionally, pancake holsters have been made from leather, though many now use man-made materials. The Uncle Mike’s Tactical Reflex Open Top holster was designed in conjunction with law enforcement personnel to offer outstanding retention and a fast draw. It is an OWB design with integrated pancake loops for belts up to 1¾ inches. The Reflex is made in the US, using injection molded, impact modified polymer. The Reflex holster uses a retention system that has no buttons or straps or levers. Instead, the user simply rotates the holster slightly inward toward the body on the drawstroke. The inward pressure releases the pistol, and allows the wearer to draw it. The Reflex Open Top includes a paddle mount, so the user may either mount the holster using the pancake loop or use the paddle instead. The Uncle Mike’s Reflex Open Top is also affordable, and can be purchased for the best price online at Amazon. The Galco Concealable Belt Holster is a pancake holster with an outer shell made from premium saddle leather. It is designed to be worn in the 3,4, or 5 o’clock position for a right handed shooter, or in the 9,8, or 7 o’clock position for lefties. 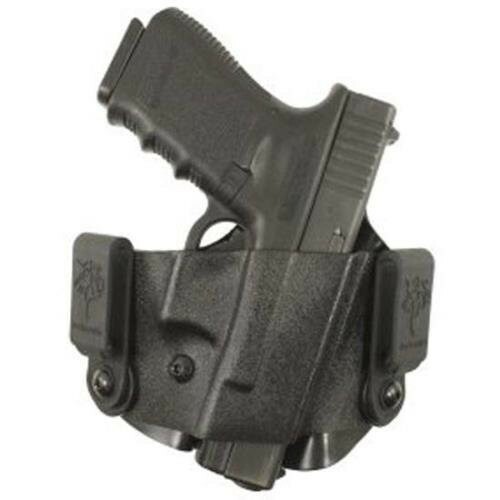 The Concealable has two piece construction that allows all of the molding to be on the front of the holster, so the sides have maximum flexibility to conform to the wearer’s body shape. 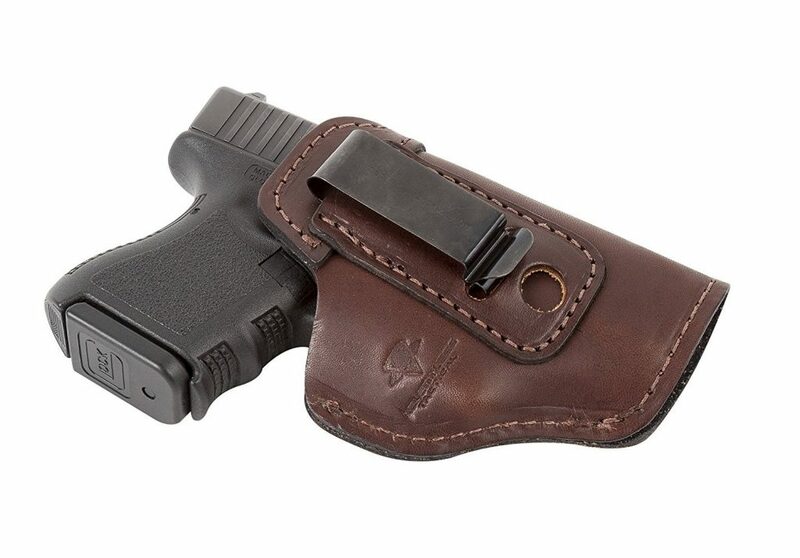 The holster is designed with a very narrow profile for maximum concealability. The Galco is hand molded to individual firearms, which gives it a nice tight fit and excellent retention ability. It also gives the holster a nice appearance, as does the premium leather and the double stitching. It features a fully covered trigger guard for maximum safety during drawing and reholstering. 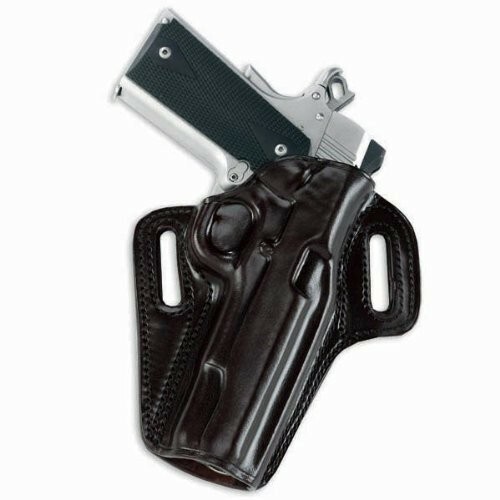 This holster has been named one of the best OWB holsters for the Sig P220 by Holster Magazine, and is rated 4.5 out 5 stars. The Gould and Goodrich paddle holster (model B807) is another example of a classic leather holster, this one in a paddle design. Reasonably priced, the B807 is made in the US from top grain vegetable tanned leather. The holster also features a paddle which allows the cant of the holster to be adjusted to fit user preference. The Gould and Goodrich B807 appears to be well made from quality materials. It also received high marks from verified buyers for its fit to the pistol, excellent quality and appearance. The Relentless Tactical Defender is a high-quality leather inside the waistband holster that sells for quite cheap, despite being handmade in the United States from premium bull hide leather. It is available in left or right hand configurations, in either brown or black leather. The holster fits many different styles of handguns, in fact the Defender will fit more than 80 models of pistols. For someone who owns and carries several pistols, having several versatile holsters is more cost-effective than having many holsters that only work in one situation. The Relentless Tactical Defender holster is very durable for a leather holster, due to the heavy duty leather construction. It comes with a robust metal IWB belt clip, and has a lifetime warranty. The Defender has very high ratings online, and gets high marks for quality and durability. The DeSantis Gunhide Scorpion II IWB holster is custom molded for the Sig P220 and various other pistols. It is made in the United States, using Kydex for a true custom fit to the gun. 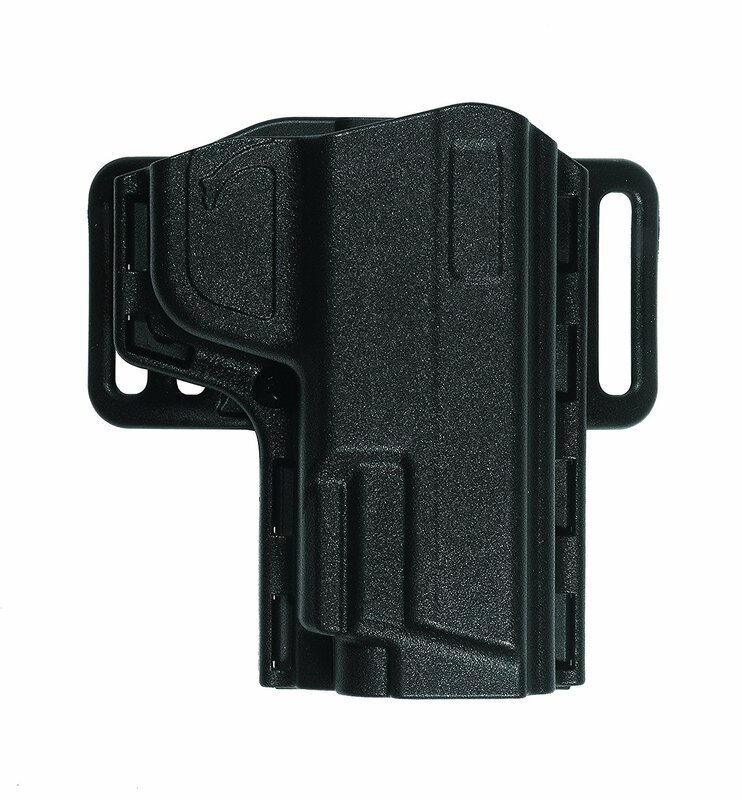 The tight fit of Kydex holsters offer some level of retention, and the DeSantis also has a passive retention system. The security is adjusted via a retention adjustment screw beneath the trigger guard. The Scorpion II is designed for maximum concealability and low signature, and includes tuckable C-clips. The C-clips or optional J-clips are adjustable for ride height and cant for a more customizable fit. The DeSantis Gunhide Scorpion II IWB holster is available on Amazon for the best price online. Of the holsters discussed here, the Uncle Mike’s Reflex Open Top has the best blend of security, accessibility, concealability, and one-handed reholstering ability. Uncle Mike's Open Top Reflex offers both decent concealment, and good retention qualities. It is made in the US, using industry standard materials, and is the least expensive holster in this bunch. Despite its low price point, it offers outstanding features and value. 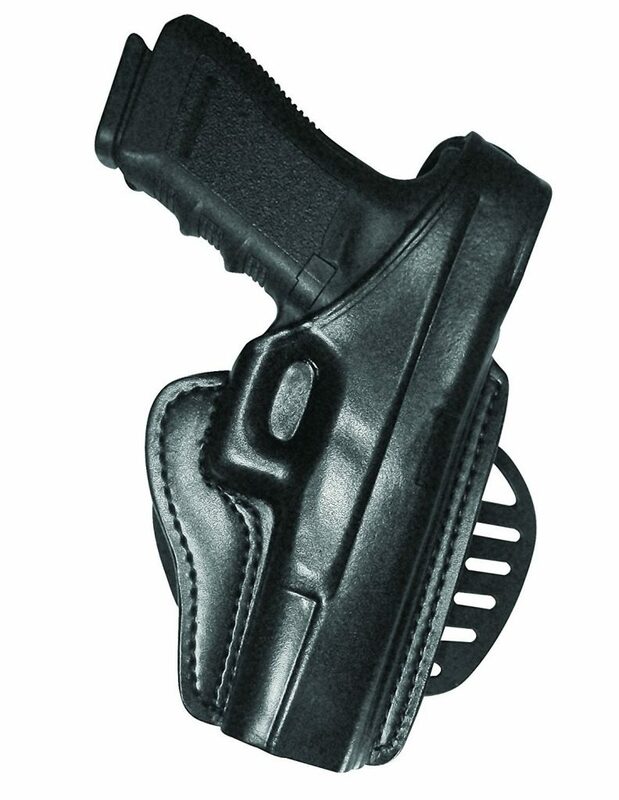 It is the only holster here that is specifically designed with an impressive passive retention measure built into it. It is made in the US with industry-standard materials. It also offers the versatility of integrated pancake style loops for maximum concealment, or a paddle for maximum comfort. The Uncle Mike’s Open Top has the most value for the money, which is rare in the premium holster market. There were a few really nice holsters in this comparison, but the one that really shined through was the least expensive of the bunch. A holster is definitely an investment, as it carries a potentially life saving piece of equipment. It’s important to go into the purchase with an attitude of quality before price. Every once in awhile though, it is possible to get both in one holster. The best holster for Sig Sauer P220.